If you want to use a CFL lamp with an standard reflector - you can! 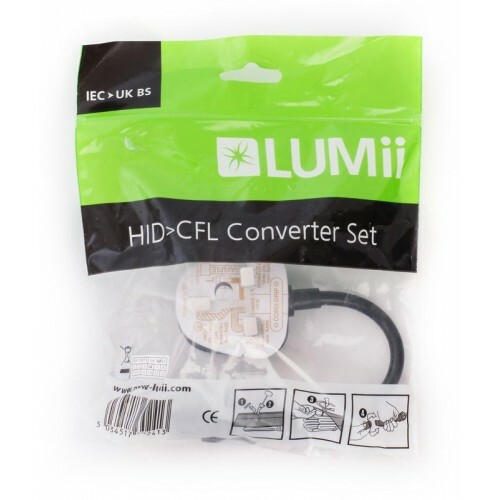 The LUMii HID to CFL Converter lead allows IEC reflector leads to convert to a wall plug lead. This kit contains a short additional cord set to convert the supplied IEC to a conventional power supply. In addition there is an innovative support device to assist with the additional weight of a CFL lamp. Pro Star CFL Grow Lamps The Pro Star CFL lamp range is bought to you by the same people who mak..
CFL Lamp Holder and LeadThe Plug and Grow CFL Lamp Hanger comes with a standard E40 lamp fitting, 4 ..
Lumii HID To CFL Converter Lead If you want to use a CFL lamp with an standard reflector - you ..